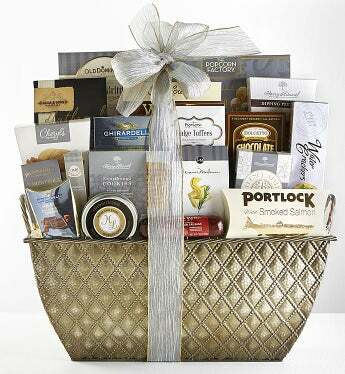 All the delectable trimmings to nourish a gourmet celebration are found in this truly distinctive gift basket! This wonderfully generous basket conveys your most tasteful wishes with Ghirardelli® Squares® Milk & Caramel Chocolates, Portlock® Salmon, Cabernet Cheddar Cheese Spread, Everything Flatbread, and much more. Beautifully arranged, this handsome chevron embossed basket delivers a host of delicious delicacies in style. The gift makes a tremendous impression whether sent to family, friends, or business associates.